Not counting the normal, Oklahoma stuff from his dad’s side of the family, 15-year-old Jimmy Dugan had 11 names. Most of them were pretty weird, but the name his Eskimo grandfather gave him looked as if it might even get him killed. A gray cloud of ice-fog surrounded his face with every panting breath. Deep, bone-numbing cold seeped through the thick fur of Jimmy’s parka. His feet, layered in heavy wool socks and sealskin mukluks, felt like frozen blocks of meat. His body was one big ice-cream headache. Under low clouds and a weak arctic sun, seven huskies shivered in harness, bushy tails curled around their feet. Eyes, rimmed in tiny ice crystals, squinted against the bitter air. The thermometer hanging on the handle of Jimmy’s dogsled read 37 below. Spit snapped before it hit the ground in such conditions. Trees exploded as sap turned to ice. The dogs’ feet cracked and bled. Jimmy had heard stories of men who’d cut off their own frostbitten fingers just to survive. He stopped the team on a frozen pond in the middle of an endless white plain. There was no wind, and the moisture from his breath and the panting dogs pooled into a foggy soup at his feet. Jimmy kicked at the swirling cloud with his mukluk, then slumped against the sled, clenching his teeth in a shiver that shook his entire body. A dozen other figures, some on snow machines, some with dogs, moved like gray dots up and down the river — all searching, just like him. It was March, the season Yup’ik Eskimo call “When-Seals-Are-Born.” Back in Tulsa, Jimmy’s friends would be mowing their lawns. But in Alaska, on the ice-covered tundra of the Yukon Delta, winter wouldn’t release her frozen grip until May. He wished his dad’s deployment in Iraq would end so his mother would take them back home — back to civilization. He was only a kid from Oklahoma, no matter what his grandfather said. In Yup’ik tradition, almost every-one gave him a different name. To his grandmother he was Kakeggluk, translated as “Runny Nose,” because he was allergic to just about every-thing on the planet. Auntie Vera called him “Dear Little Husband,” because when Jimmy was a baby, he’d supposedly looked like his big-eared great uncle, who’d died shortly before he was born. What a joke. Jimmy had never hunted anything but a few ducks —and he wasn’t very successful at that. Then two boys went missing while they were out checking blackfish traps set below the river ice. With most of the men from the village off hunting seals, the boys’ mother had come to beg Nukalpiaq for help. “Surely,” she’d explained through her tears, “the Great Hunter’s grand-father had seen something special in him. …” Her boys were only 6 and 8 years old. Surely someone with such a name could help her find her little ones before they froze to death. Jimmy had been up and down the river six times already without finding a single track. He buried his face in his mittens, wracking his brain for what his grandfather would do. The huskies tugged at their harnesses, eager to get moving in the cold. Chinook, the lead dog, threw back his great, gray head and gave a mournful howl. jumped across at the last possible instant, choosing to stay with his friend, man. Even now, dog’s sorrow-ful howl was his way of talking to his wild brothers across that great divide. The huskies nearly tugged the sled out of Jimmy’s hands. Subzero air seared his lungs as he trotted to jump aboard the runners. 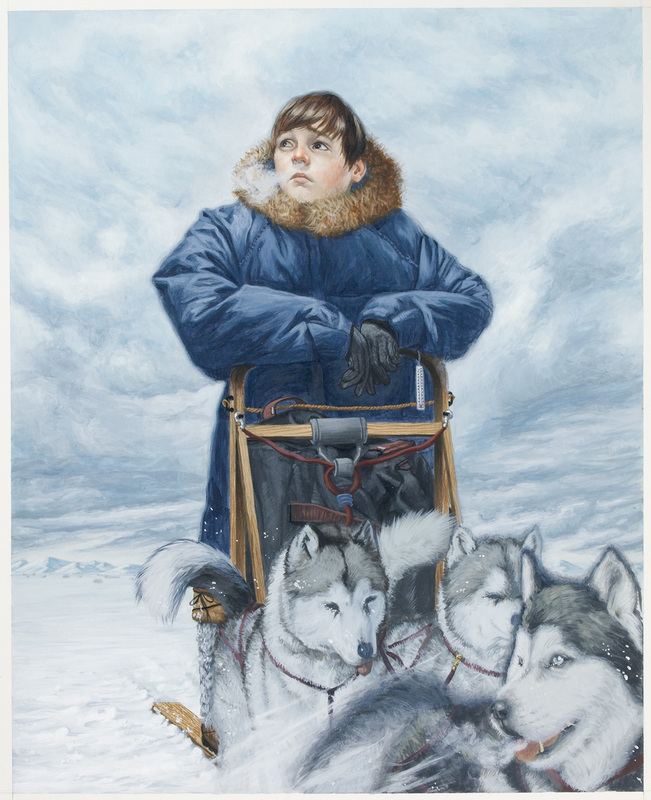 There was no sound but the jingle of the dogs’ traces and the hiss of the sled over ice. The dogs suddenly veered right, toward the middle of a smaller river that fed into the mighty Yukon. Chinook stopped in his tracks, looking back over broad shoulders. He sniffed the air. Frosty steam from his panting drifted in the still air. The sun, lower now, peeked between gray clouds and the frozen expanse of the Bering Sea. In the long shadows ahead of the dogs, Jimmy saw two impressions in the snow. Faint tracks followed the trail of a snowshoe hare, barely visible in the rock-hard ridges of white. Ten yards farther, they vanished at the edge of a gaping hole he’d missed on his earlier searches. “Chinook! Haw! Haw!” Jimmy cried. 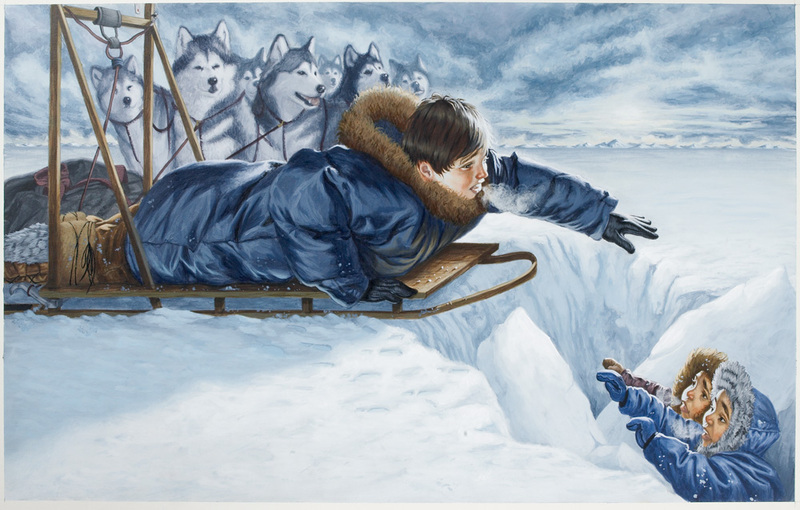 The powerful lead dog obeyed, dragging his teammates and the sled to the left. He stopped dead-even with the treacherous break. Chinook whined at the jagged hole. Slowly, the dog tugged the sled toward it. The ice hummed and popped like gnashing teeth beneath their combined weight. “Helloooo!” A muffled cry rose from the ice. “M-m-ma-mamaaaa!” a second voice sobbed. Quickly, Jimmy unsnapped the gang line and anchored the dogs to the ice with the claw brake. Then, flat on his belly in the basket of the empty sled, he inched forward. The long runners distributed his weight, and he moved to the edge of the hole. Two boys gazed up from the blue-gray shadows three feet below. An early freeze had flash-frozen the river. The water level beneath the ice had dropped before it had frozen solid again, leaving a cave-like tunnel between two sheets of ice. The boys had found a weak spot and fallen through the top layer. Frozen tears streaked dirty faces, framed by fur parka hoods. Pudgy cheeks almost closed their eyes as they grinned up at Jimmy. The boys shivered badly as Jimmy hauled them up from beneath the ice. He gave them hot chocolate from his thermos and some oatmeal cookies he had kept under his parka so they wouldn’t freeze solid. This entry was posted in Fiction and tagged homepage, Reading contest, Slider on January 9, 2015 by Clay Swartz. Here are the winning essays from the 2012 Boys’ Life reading contest. 1st place: Pierce Robinson, Arlington, Tenn. The best book I read this year was “A Brief Biography of Thomas Edison” by Frances M. Perry. In this book I learned that Thomas Edison started working when he was 12 years old. He sold candy and newspapers on the railroad. Then he started a printing press in a freight car on the train to make a newsletter about train life. After that, he started a small laboratory so he could experiment with different chemicals and explore his ideas. Edison spent most of his life inventing products that would change the world. Among his most famous inventions were the electric light bulb and the phonograph. I liked learning about Thomas Edison because he was an inventor, and I plan to be an inventor someday. Just like Edison, I want to use my imagination to create useful things. As an inventor, I will continue to follow the Cub Scout Promise to do my best and to help others. I enjoy being in my Cub Scout pack because we have the opportunity to build things like our pinewood derby cars, raingutter regatta boats and other projects. We also have lots of fun. I think Thomas Edison would have been a very good Scout! 2nd Place: Michael Boddy, Bellingham, Mass. My favorite book that I read this year was “Stitch Head” by Guy Bass. It is the story of a crazy scientist named Dr. Erasmus who creates strange half-human monsters in Castle Grotteskew. Stitch Head is Dr. Erasmus’s first creation. He is cute and almost human, but because he is a monster, he stays inside the castle. Dr. Erasmus is excited about each new monster as he makes it, but once he finishes it, he loses interest. Dr. Erasmus moves on and starts making a new monster, which he hopes will be even better. Dr. Erasmus is never happy with what he has or with what he creates. He is always looking for a better monster. Stitch Head spends most of his time forgotten, trying to get attention. He is a smart and cute little guy, but he feels like he does not matter. Stitch Head spends a lot of time helping other monsters get used to Castle Grotteskew. He tries to get all the monsters to live together without hurting each other. One day a traveling circus comes to the castle and promises to make Stitch Head famous. Because Stitch Head always feels like he is not important, he wants to go with the circus and become a star. This will be his chance to make everyone think he is important and to have his dream of being famous. But, before Stitch Head can go with the circus, Dr. Erasmus’ new monster escapes from the castle. The new monster is named Creature, and Stitch Head needs to find and save Creature before he gets hurt or hurts someone. Stitch Head become friends with Creature. Creature helps Stitch Head realize that he has true friends, and that he really does matter. Creature also teaches Stitch Head that life can be fun. I like this story because it shows how everyone matters. I think the story also shows that you should be happy with the friends you have and not forget about your old friends. I also liked the chapter headings because they had little poems that hinted at what would happen in the chapter. 3rd Place: Samuel Mantovani, 7, Oyster Bay, N.Y. I read “The Littlest Volunteers” by Danielle Speckhart. It’s about helping others. In this story, an ant named Annie and some friends are learning about volunteers. She and her mom are setting up something called “Help Your Neighbor Day.” At first, Annie doesn’t know that at any age you can be a volunteer. Her mom says, “If you have a big heart, then that’s a start; the rest is up to you.” Annie and her friends hold a food and clothing drive, but they make it into a fun event. She even gives out goody bags. Everyone is really happy. I love this book because it gives good messages and is about helping others. Helping other people can make your community and the world a better place. Helping other people is a Cub Scout thing to do. I am a volunteer for Island Harvest, a local food organization, and I have my own food drive. Every month I collect food for people at the supermarket, and then I go door to door. If I can do it, you can too! The best book I read this year was “Eragon” by Christopher Paolini. This story is the first in a series of four books. “Eragon” has a lot of action, magic, adventure and lessons about life. This book taught me about being brave, being responsible and being strong. Eragon is just an ordinary 15-year-old farm boy. He finds a blue rock in the mysterious and dangerous Spine forest. This blue rock was actually a dragon egg. When the egg hatches in Eragon’s presence, he becomes a Dragon Rider. This book teaches me that growing up is not the easiest job, because things don’t always happen as wanted. Sometimes there are things you cannot control. For example, Eragon cannot stop the evil Ra’zac from killing Garrow, his uncle. Eragon has to leave Palancar Valley because he realizes the Ra’zac were after him. During his journey, Eragon encounters Urgals, slavemakers and the Ra’zac. While fighting these enemies, Eragon is injured many times and passes out after using too much magic. Yet he never gives up. This makes him a brave hero. The second lesson is to be responsible. Eragon has a responsibility as a Dragon Rider. Others look to him as a leader because Dragon Riders can use magic to destroy the cruel and evil Galbatorix. The hardest decision Eragon has to make is whether to join Galbatorix or join the Varden, people who left Galbatorix’s empire. If he joins Galbatorix, the Varden will be destroyed. However, if Eragon joins the Varden, then the Varden has a better chance of survival. Eragon chooses the Varden to fight for survival because it is his responsibility as a Dragon Rider. Like Eragon, I am responsible for many things. At home, I feed my dogs and do chores. At school, I follow the teacher’s directions, listen attentively and learn. As a Webelos Scout, I have to put up flags, do my best and help others. The third lesson is to be mentally and physically strong. Eragon learned the ancient language, and he also learned how to read. This keeps him mentally strong. To stay physically strong, he practices sword-fighting with Brom. Eragon has to hide from his enemies to survive. There are hard times, and the difficult journey across well-armed cities, rivers, mountains and deserts takes him months. In the Hadarac Desert, Eragon runs out of water, so he uses magic to get water from the ground. For me, to be strong when I am sad, I remind myself that my mom is here. To be physically strong, I play sports. Reading “Eragon” took me 22 days. This book was challenging for me because it was above my reading level. The book was 497 pages long, and it was the longest book I have ever read. In the next book, will Eragon go to the Mourning Sage and find answers to all his questions? Will Galbatorix fight Eragon? In order to find out, I want to continue reading Eragon’s adventures. 2nd place: Samuel Park, Concord, N.C.
One of the books I really enjoyed this year is “The School Story” by Andrew Clements. The story is about a girl named Natalie who has an incredible talent for writing. One of Natalie’s friends, Zoe, convinces Natalie to try to publish her book. So Natalie uses a pen name, Cassandra Day, to send her draft. Natalie’s mom works at a publishing office, and before long she gets very excited about Cassandra’s manuscript. She doesn’t know that Natalie wrote the story. Eventually, after many hours of hard work, Natalie’s book gets published, and Natalie is revealed as the author. One of the points that I enjoyed most from the book was finding Natalie so determined to publish her book — going through the editing process using a pseudonym, even hiding from her mom! Another great thing about this book is that Zoe helps Natalie out and sticks by her like a true friend. Even when so many rejects and changes are made to the manuscript, Zoe helps Natalie through them all. The last point that I liked in the book was the importance of a caring, trusting and faithful family. Natalie expressed her feelings in her book, so when she finally revealed herself, her mother knew exactly how she felt. “The School Story” is a great book. It shows determination and the importance of good friends and family in hard times, which reminds me to be nicer to my brother. I give “The School Story” five stars! 3rd place: Sean Corcoran, Lawrenceville, N.J. The best book I read this year was “The Time Machine” by H.G. Wells. “The Time Machine” is about an inventor who makes a machine that can go backward and forward in time. When the inventor gets to the year 802,701 A.D. he finds a people called the Eloi. Eventually, when he tries to get back to the time machine, he sees that it has vanished! I wonder how the inventor felt as he traveled? Was he nauseous, distressed or curious? My favorite part is when the inventor travels into the future, because I like how Wells describes what the inventor sees. This is a great book for children and adults who like adventure, action and science fiction. I enjoy reading books about inventions, and this book shows readers a new way to think about how Earth and humans may look in the future. The inventor makes the time machine out of materials that can be found around the house. This is a skill that Boy Scouts need if, for instance, they need emergency shelter. One lesson of the book is that people should take one day at a time. “The Time Machine” makes you wonder if time travel is possible and, if it is, which time would you visit? I would visit the year 2016, because I would be a teenager starting high school and would like to see what has changed. “The Time Machine” is the best book I read this year. 1st place: Peter Jacobs, Chesterfield, Mo. The best book that I have ever read is called “Do Hard Things” by Brett and Alex Harris. This book is about the world’s low expectations for teens and how, together, this generation of young people can drastically change the world and become a powerful force for good. Although it never directly talks about Scouting, the book teaches many of the same principles as Scouting: how young men should take responsibility and not just do the easy thing. In the beginning, the authors tell about the myth of adolescence, which is the general thinking that teenagers are naturally lazy people of whom little should be expected. As society has moved into the 21st century, young people have been expected to do less and less. An average teenager is expected to get average to bad grades at school, come home, do a chore, homework and then play videogames. Prior to the 1900s children older than 5 were expected to do more than the average teenager today. It is because of the myth of adolescence that the young men and women of today are not being encouraged and made to act and work more like adults. The book goes on to explain three first steps. It’s always scary to first step out, do something out of the comfort zone and make an impact. Part of building self-trust and becoming a more reliable and responsible teen is to take these three steps. This may require acting when friends and culture ridicule such an effort. Later on the book teaches a concept often taught in Boy Scouts: the power of working together. This can be the changing factor in a hard situation. Many times it is hard to do something for the first time by yourself, and the encouragement and help of a friend can help. Also, two can do anything faster. The two authors of the book describe a time when they were setting up a survey. Within a week of many people chipping in, they had their own website. It’s amazing what teamwork can do to make a job or responsibility easier. This book showed how my culture has low expectations for me, as a teen. This is a standard that has hindered this generation from really providing support to our society. There is a need for teens who can step up, lead our country and go above and beyond the shackles of our culture. This book teaches how to do it. 2nd place: Trey Patuka, Villa Rica, Ga. I read “The Jungle Book” by Ruyard Kipling this fall. The book is about a man-cub who is alone in the jungle after Shere Khan, the tiger, scares off his parents. A wolf family finds him and brings him home to their den. Mother Wolf names him Mowgli, which means “frog,” and he becomes a part of their family. When he gets a little older, it’s time for all the cubs to be approved before the council. The cubs sit in the middle of the pack. Akela, the wolf leader, sits on the council rock and says, “Look well, O Wolves.” Each cub must have two people besides his family speak up for him. Bagheera the panther and Baloo the bear speak for Mowgli, and he is now a part of the pack. The rest of the book tells the story of Mowgli and his life in the jungle. He has many adventures with his friends, Bagheera and Baloo. They help him and teach him the laws of the jungle. Father Wolf, Mother Wolf and his wolf brothers and sisters are also there for him, and he cares about them very much. The Cub Scout program is based on “The Jungle Book.” Tiger, Wolf and Bear are the first three ranks. Parents and leaders are Akela, named after the wolf leader in the book. Scouts are divided into dens by their grade levels, and when all the dens get together, it is a pack. I’m really glad I read this book. It was an awesome story and I didn’t want it to end. I wanted to read more about Mowgli and his life. Though I’m a Boy Scout now, I really enjoyed Cub Scouts. My mom is a Cubmaster and always tells our pack about “The Jungle Book.” It was neat to actually read this book myself and see the connections between it and Cub Scouts. 3rd place: Tyler MacInnis, Matthews, N.C.
Of all the books I have read this year, my favorite is “Out of the Silent Planet” by C.S. Lewis. This book is about a professor named Ransom who meets an old friend named Devine and his friend Watson. Ransom discovers that they have imprisoned a young man. After doubting their explanation for this, Ransom is drugged and pulled into an extraordinary adventure in space. The main reason that I read this book more than once is because of my love of outer space. The author describes space as such a beautiful place. We do not usually fully picture it this way, and for me, it is that feature that makes “Out of the Silent Planet” a true sensation to read. I also like this book because of its mysterious tone, which silently urges you to read on in wonder and amazement. This book contains underlying religious analogies. If you pay attention and consider what God may have created on other worlds from our own. One example is the Eldila, which are similar to angels and are seen only by the intended receiver of the message. The thing that I love most of all about this book is how it takes the impossible and makes it believable. It takes a spaceship shaped like a soccer ball and allows it to support three humans on a journey to Mars and back. It also views Mars as an inhabited planet with trees and water, which we know is completely impossible. This book presents its information in a way that helps you completely dispense of today’s beliefs, so that a fantastic adventure and truly mind-changing philosophical understanding of religion can be presented to you. This entry was posted in Book Reviews and tagged Reading contest on April 22, 2013 by bwursten.